Would you like to eliminate your repeat field dispatches by over 50%? The increasing speed and complexity of DSL technology and customers’ expanding applications for HSI (High Speed Internet), service maintenance, repair and support is becoming more challenging. When repeat problems like intermittent faults and slow Internet speeds go unresolved, they lead to repeated subscriber complaints and customer churn. Highly automated to make sure all critical tests are performed accurately and consistently. Capable of being operated by all technicians regardless of experience level. Suitable for integration into the service provider’s centralized test system, if this is desired. Compact enough to be shipped with the service provider’s CPE equipment for proactive treatment of target customer groups. Used by field technicians, Tollgrade’s new revolutionary Virtual Broadband Technician (VBT) for broadband service providers, pinpoints the causes of problems at the customer premises (in the home or local access network) that are difficult to find, diagnose and can disrupt or slow down broadband services, leading to repeated call center complaints and field visits. Illustrated below are a few examples from actual field deployments where the VBT was able to lead the field technician to the source of repeat problem that had previously been missed. 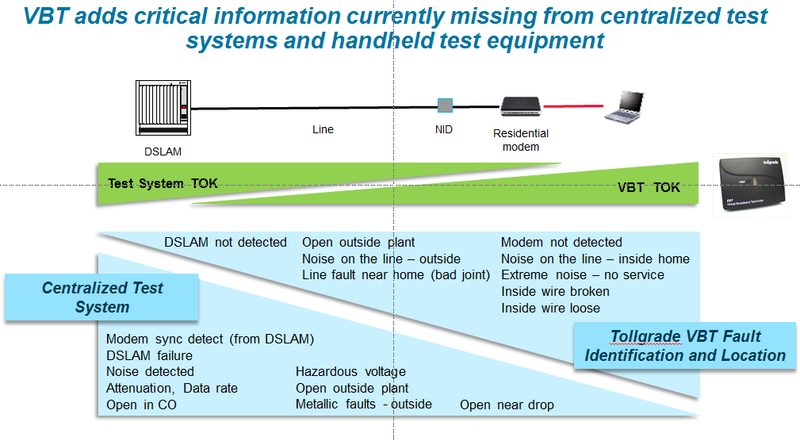 Actual data from VBT field deployments found that 82 percent of tested customer premises equipment (CPE) would have been returned unnecessarily had it not been for the diagnostic capability of the VBT. By correctly pinpointing problems inside the home that would otherwise have been left undiagnosed, the VBT reduced repeat dispatches by over 50 percent. With fewer field visits and returned equipment, VBT enabled service providers to yield a payback on their investment in a matter of weeks, while significantly improving customer satisfaction. To learn more, visit In-Home Broadband Testing or view presentation by clicking here.